Ever want to know what all you will need to level up a crew? Not sure who to take in a behold? Can't decide who to work on next? Let me introduce you to the Crew Cost Page. 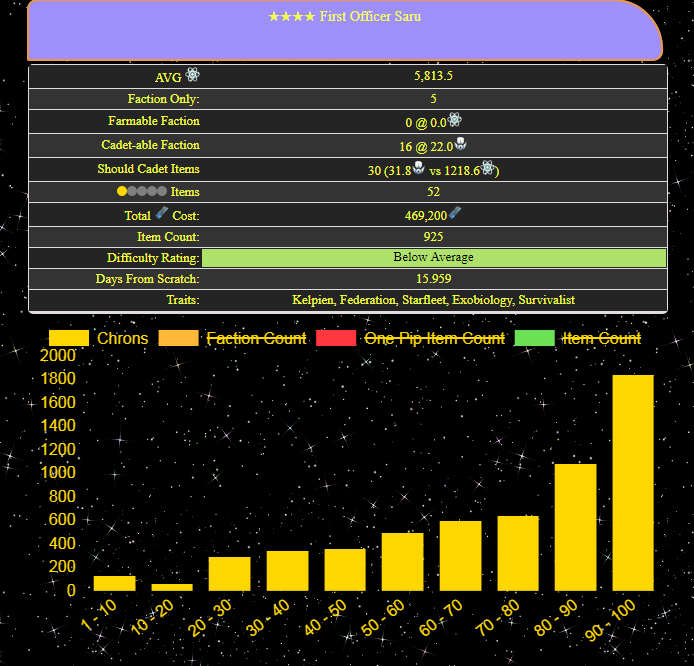 The crew cost page scans the wiki 4 to 6 times per day to get updated crew info, and then breaks down each crew member. 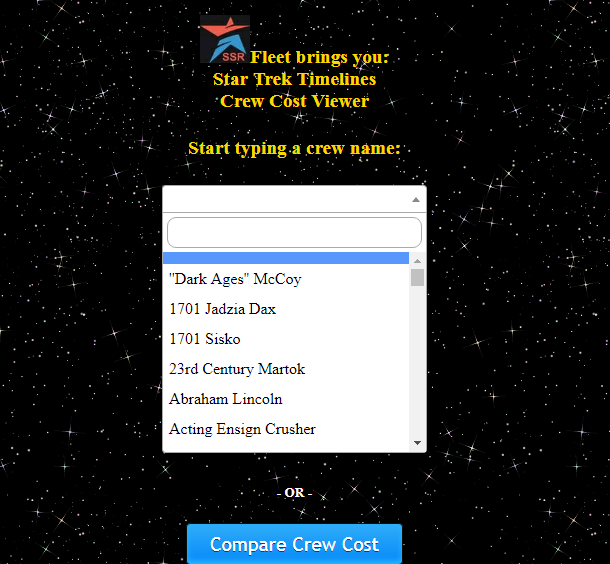 You can compare all crew together, or by star rarity in a single table. See who's easy or not. Have a troubling behold? Select the behold helper, and enter as many crew as you want! You will be able to view each breakdown side by side to see who will be a good fit in your crew. So, check out the Timelines Crew Cost page today! This is a great tool. I've been using it for a while, and only this week I discovered that in the second screenshot, you can click on the strikethrough text to display bars for the other items. I never realized why that text was there like that before. 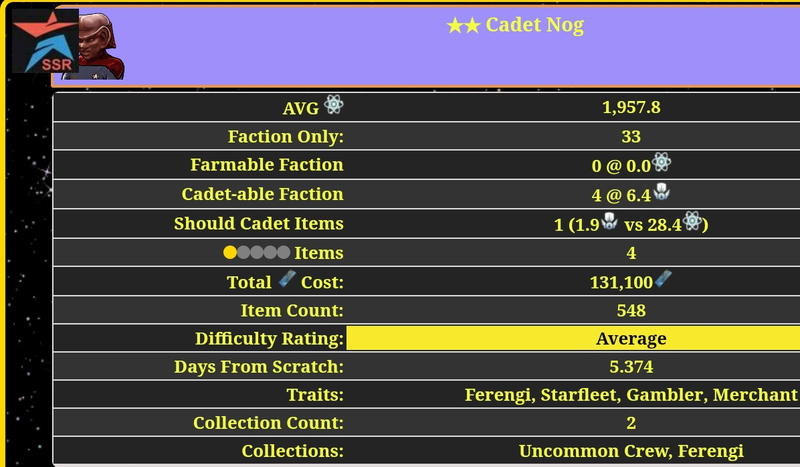 Would it be possible to add Voyage scores at each level of fusion, at least for 5* crew? Yeah, can add that in. Of course it'll only be as good as the wiki for stats that are entered. Hopefully have time in the next few days/weekend to get it in. Hey found some time today,and this should be showing up now on the pages. 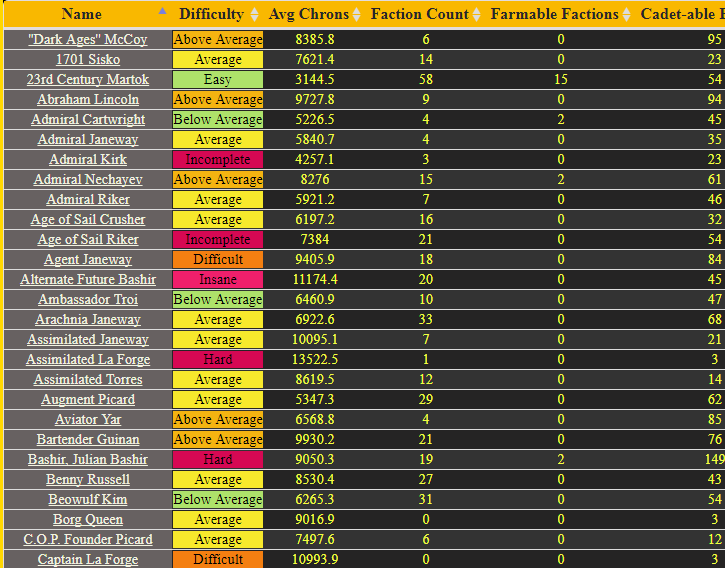 It'll be in its own table below the main stats table. Let me know if something if not displaying right! I love it, especially the addition of the total score! Thanks so much! Fantastic job! I've been using it as a reference for a while to see what Faction items I need to stockpile before leveling up crew members, but I have yet to use all of the great features. Please keep up the good work! Also, out of curiosity, what method do you use to generate the list of items and costs? I have shared a spreadsheet for Galaxy events, but I'd love to find a way to lessen the necessary work on my part. this and the wiki are my go-to resources ... thanks! Would it be possible to show the items in the level list in alphabetic order? Thanx for a great tool. Love the tool. Hate the pop-ups and constant redirect to skeezy pages. I've made the change, so you should start seeing them show in ABC order now. If not let me know! I use the wiki API to scan the drop test and recipes that users have entered. Looking good. Thx very much for the change. It does make it easier to use when I'm working on one of those dang convoluted recipes! 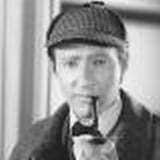 I've used the API to retrieve specific pages (i.e. 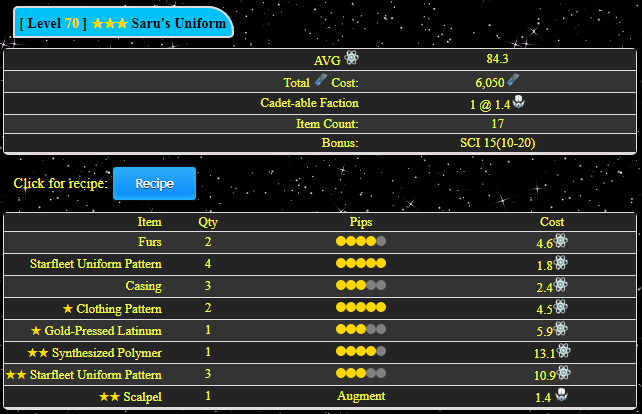 all crew pages) and then parse the wikitext for each crew to suss out the info I want. Is parsing the wikitext the easiest way to get specific info or is there a better way? 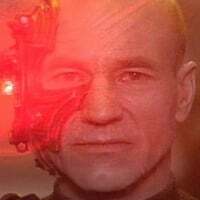 I am parsing the wiki text. Not sure if the easiest, but it works for me. Some people use a library to turn the wikitext into objects that are easier to talk with using a specific commands. Also if you get the HTML you can turn it into dom objects and deal with it that way. 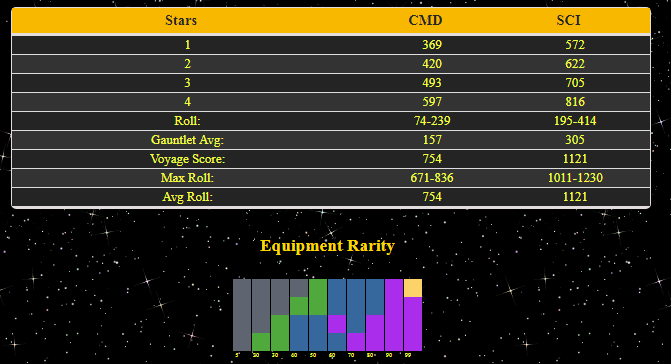 I've been fiddling with the weighting on the primary/secondary voyage skills. Has anyone determined what the best multipliers are? When you're weighting your stats like this, the biggest downfall is over-weighting. If you're trying to hit the 8hr mark, for example, you don't want to push your primary skill above 9600 or so at the expense of other stats. This is very possible if you have primarily FF 4*s and a few 5*s.
Skill thresholds exist at lower tiers as well (4800 for 4hr, 7200 for 6 hr). For SCI/MED/ENG, I find that a 2x multiplier does a good job of pulling them out. For SEC/DIP/CMD, I only do a 1.1 to 1.25 multiplier, since I'll be pretty close to capping the stat anyways, so other stats become more valuable. Hey where do I go to suggest a new character? Not really bug but bug: DS9 Hyperspanners. Everpresent suggestion to cadet them. Hyperspanners are in normal EAS and with drop chance it's easier to run epic then farm hyperspanners normally. As in - chance 1.7 tickets per hyperspanner. Meaning loss of 10*1.7 = 17 chrons if farming Science Experiments on Epic. With basic cost 11.3 chron per hyperspanner it's 6 chron difference and at 1.7 not acquired Science experiments on top of that. Other two worthy drops are Translation algorithms that are better run in Epic EAS (more Algorithms AND Hyperspanners) and Cards... which are rare enough requirement that after 2 or 3 Fed Faction events they'll never be lacking. I believe there's a threshold (around 10 chrons) where he recommends cadet-ing for an item vs. farming. Translation Algorithms are 9.3 chrons, so they don't quite make the cut off, but DS9 Hyperspanners are at 11.3, so it shows the two options. Well, but in case with DS9 Hyperspanners it's very clear loss. And gives wrong cost in result. As with any optimization tool, it can't be perfect. It pretty clearly shows you the options. If you wanted hyperspanners AND translation algorithms, for example, that mission is about as efficient as they come. If you wanted hyperspanners AND translation algorithms, for example, that mission is about as efficient as they come. Same mission Epic explicitely give more TAs and provide difference in chron that allows to farm more Hyperspanners than drop from cadeting. Hey so peachtree was correct i had a threshhold of 10 chrons and if that item was a 1 or 2 pip item. And since i put that change in, i haven't bothered with it much. This page is quite a large project, and havnt had much time to work on it lately. But i just changed that threshold to 15 chrons, and will see how that feels over the next few weeks. This page is quite a large project, and havnt had much time to work on it lately. Btw, I hope that anyone who uses your page as much as I do will at least consider either donating or buying your app (as I did some time back), as a way of saying "thank you" for making this resource public. I don't know how I ever got by without it. 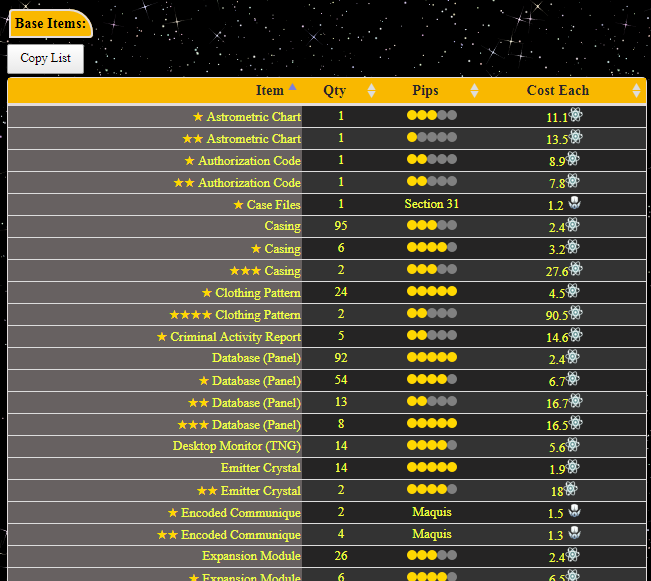 I have added collections info to the crew cost page. Crew breakdown will show count and which ones, and the compare crew cost table has a column for the count.